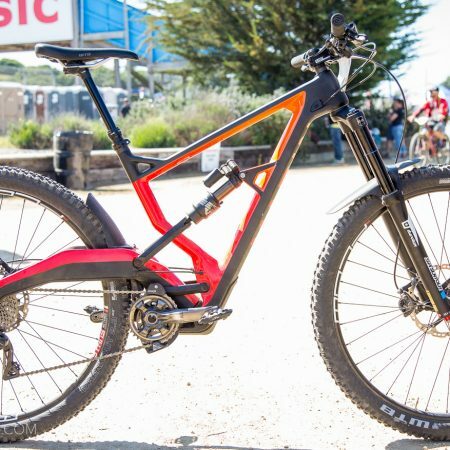 I must not have been paying attention, because when we ran into the Specialized Wrecking crew at the Demonstration Forest trails near Santa Cruz a few weeks ago and saw they were all astride 29″ versions of the Enduro, I didn’t think much of it. Bad, bad, bike blogger. I’m so totally fired, and going to bed without dinner. That didn’t mean it hadn’t peaked my curiosity. Brandon Sloan— product manger for the MTB performance line— was actually nice enough to hold our camera when my girlfriend wanted a shot of our group before we split up to attack the trails. My keen eyes quickly spotted the big wheels and raw chainstays of his test bike, and I of course had to bug him to learn more about it. I’ve always been a fan of how Mr. Sloan specs out the Stumpjumper and Enduro lines. 70mm stems on a size medium trail bike? Yes please. When many manufacturers are still putting XC length stems on bikes destined for the show room floor, you have to appreciate a proper spec. 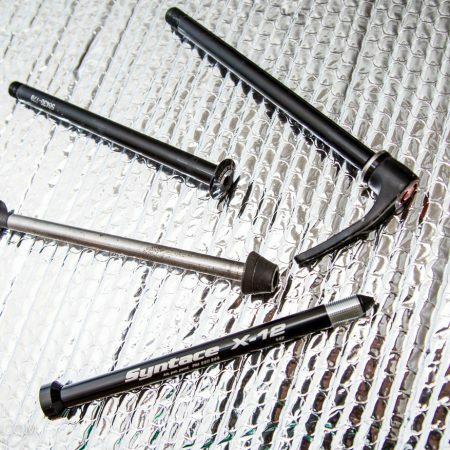 With those bikes, the first thing riders in the know do is replace the stem, bar, and saddle. The cost adds up. 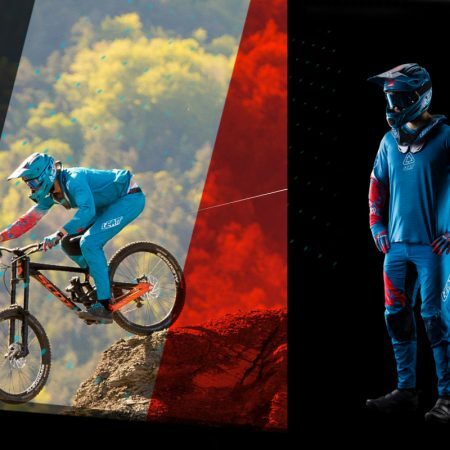 While Specialized specs much of their line with house-branded kit, it is all decent stuff, and worth keeping. But I digress. 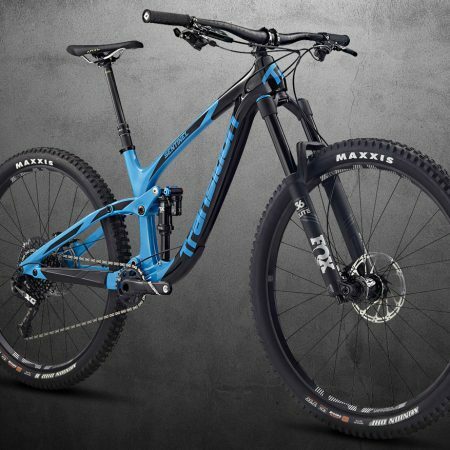 Besides the dialed complete bike specs, the Stumpy and Enduro are known for the low bb heights and short chainstays, designed for trail performance. I’ve always been a fan of how Specialized trail, AM, and DH bikes ride down the hill- they totally shred. Pedaling performance on mellow trail surfaces is where FSR rear ends start to lose me, which is why I made a switch to riding better pedaling VPP bikes. The new 29″ Enduro isn’t designed for smooth trails though. It’s designed to kill it from the top of the mountain down, and when we saw the guys on the trail, they were straight shredding. I rode up with one of the guys during the pedal up, and he was cruising the climb just fine- in fact, my pathetically low level of fitness meant I got dropped. By an Enduro, with big wheels and way more travel. Damn. I need to ride more. According to Mr. Sloan, most of the guys have switched to riding the big wheels almost full time. 650b? Nope- they’ve obviously tested it, and since the new Enduros were designed to bypass the complaints and issues around the big wheels, they found the middle size wheel didn’t actually offer any benefits. Back in the day, a lot of the guys were all about running huge diameter DH tires so they could run over everything and mob down burly trails. Somehow I have a feeling the Enduro would straight crush the bikes were were riding back then, even going down in a straight line. I haven’t really though much about 29ers based on the experiences I’ve had on dual suspension rides and my current hardtails, (fun, but not fun enough to make me want to leave my 26″ wheels) but now I’m starting to wonder what I’ll be riding on in 5 years. The bikes the Specialized crew were all riding list at $9k each, (and painted in the S-Works red the 26″ version is currently available in, a bit different from will actually be offered to the public) so I’m guessing it will be at least that long before the tech trickles down to being affordable for the average joe. It looks like they’ll start at $3500 or so, but you won’t get the S-Works weights that make it so interesting. Bike Magazine has quite a bit more on the R&D side of things. Surf away for the scoop.